As Australia gets richer, younger generations are failing to scale the ladder of opportunity. A decade of economic growth has been good to many Australians. The property market has boomed. Wages have risen. Share markets continue to ride record highs. Ordinary Australians have grown rich. But others have missed out. Two years on, the problem is deepening. A raft of statistics and reports indicate that home-ownership and job security, the twin pillars of the Australian dream, are no longer a reality for many 20 and 30-somethings. Amid a doubling and tripling of property prices, and the enculturation of casual, contract employment, an increasing segment of Generations X and Y have failed to share the gains of their asset-rich parents. They will likely never make up the lost ground. Much has been made of the rise in "grinding" poverty in Australia—an 18-month senate inquiry released in March concluded that over two million Australians are living on the poverty line. But another kind of poverty is eating at the foundation of Australia’s once impregnable middle class. “Australia isn’t doing as well as we think,” argues Mark Davis, whose book Gangland: Cultural Elites and the New Generationalism first articulated the discontents of these young people. Davis calls them “slash kids”, a reference to a culture of entrenched casual employment and declining long-term career prospects. “Now they’re getting older, they can’t afford new priorities, and resentment is growing,” Davis explains. Australia’s commodities-driven economic boom has shadowed the growing intergenerational wealth divide. A 2005 Dusseldorp Skills Forum report showed that nearly one quarter of Australians aged 20-25 are not in full-time work or education—up 15 per cent from a decade ago. On current trends, not much will have changed when this group reach 35. By contrast, the media are touting a new upwardly mobile group of 25-39 year-olds, many university educated, with high disposable incomes, and massive consumer appetites. Dubbed the NEO, or New Economic Order, by Ross Honeywill and Verity Byth in their book Neo Power, this cashed up, brand-savvy demographic no doubt spend a lot of money on mp3 players and designer sneakers; but they are not—to the chagrin of the banks and the government—getting married, having kids and buying houses. The difficulty, both for the NEOs and the slash kids, is their diminished access to property assets in a country where over half the wealth is held in housing. Bricks and mortar remain the economic lifeblood of the nation, the hallowed symbol of Australian egalitarianism. Owner-occupation levels have declined almost 30 per cent since their post-war peak. Investors have pushed the "battlers" out of the market en masse. In Sydney, a third of people are renting. Most will never own a home. A 2004 report by Brand Management argued that the new poor—which it defines as 30-somethings with limited asset wealth—will buy property, if at all, ten years later than their baby boomer parents. Commissioned for an anxious financial services sector, the report called the new poor “a ticking bomb” whose “current lack of assets” will “permanently stunt their wealth accumulation potential". 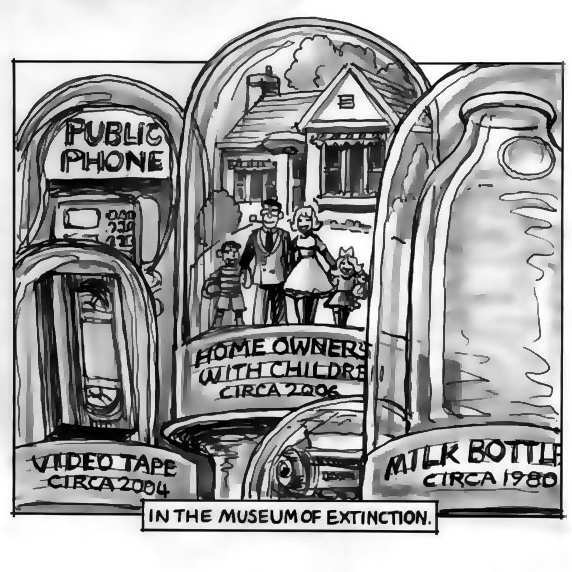 Governments refuse to acknowledge this looming generational malaise, one that will be exacerbated by an ageing population. Ironically, self-interested 15-25 year-olds who can’t remember the 1990-91 recession also envisage boundless prosperity, says a Dusseldorp Skills Forum report, Views of Gen Y, to be published in October. How long will the emerging "new poor" buy the myth of the Australian dream? Maybe they have different priorities. Maybe they are happy to rent. Daniel, 30, works for Parks Victoria for a bit more than the average wage ($50,000), and typically says a mortgage is the last thing on his mind. “The sacrifice is too great. You would do it if you could but I’ve got too many other priorities,” he concedes on the issue of a $400,000 mortgage (the average house price in Melbourne). Daniel rents a room in a share house in Melbourne’s north. He says much of his potential savings are siphoned into a HECS debt. What’s left over will go on travel. This attitude has the banks worried, as their baby boomer customer base will soon complete the mortgage cycle. But Daniel isn’t interested in "buying". Instead, he’s going to India. Mark Carden, author of the Brand Management report, backed this sentiment, concluding on ABC Radio that “we’re on the cusp of some significant social change, not just because people can't do things like buy the house where they want to, but also because the new poor are reassessing whether in fact they do want to own a house". 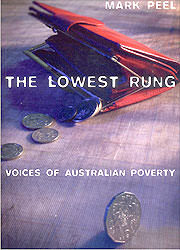 Mark Peel, associate professor in history at Monash University and author of The Lowest Rung: Voices of Australian Poverty (2003), says the new poor will soon feel “the tremendous impact” of declining home ownership in a country where some pensioners spend their entire income on rent. 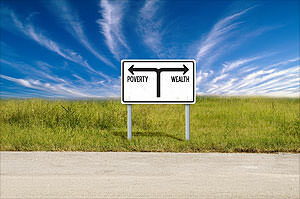 This impact has been exacerbated by the ongoing shift in intergenerational wealth. Older generations not only hold a bulk of Australian assets, but they’re living longer, have recently cashed in their parent’s inheritance, and are bent on spending their hard-earned superannuation. Retiring baby boomers opting for a sea change and a penthouse by the beach are now called SKINs (Spend your Kids Inheritance Now). 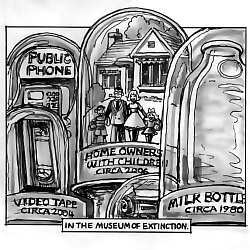 It’s ironic that unprecedented economic growth in Australia may leave a generation without a home. More ironically, few seem to care. Neo-liberal reforms have delivered globalised, unregulated markets in Australia, the unfettered accumulation of assets for the new propertied classes, and yet have killed off the dream for younger generations. The new poor can consume, can provide cheap labour to fuel the boom, but most will fail to cash in. They have simply failed to compete. And so they will have to pay the price. NO ONE wants to rent their entire life. and NO ONE wants to spent 30% of their life paying off post secondary education debts and NO ONE wants to work at some low paying mind numbing job just to pay for an overpriced rental dump. Young people have the same dreams now as old people had but the difference is the old people have removed the ladder upwards to obtaining real estate, good jobs, etc. Whomever writes articles like this has not spoken to anyone under 30 recently. The North Korean regime is more likely to be loosened from its present grip on power by the slow but persistent attempts to change the economic and psychological landscape inside North Korea, than by the external application of brute force.